Last Saturday we went to Carr's One of a Kind in the World Museum. And it certainly is one of a kind! Mr. Marvin Carr has spent his life collecting stuff he likes and the museum is a desultory mish-mash of whatever caught his eye at the time. The museum is open very limited hours (just 1-3 on Saturdays and Sundays), so we called ahead to make sure we'd get there at the right time. Mr. Carr himself gave us the grand tour! There's a car that Elvis owned; I sat my tush where Elvis's tush sat! 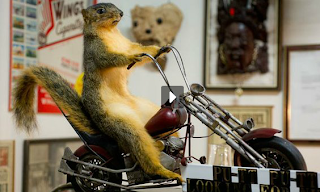 Exhibits like an impressive collection of gorgeous butterflies, a newspaper from 1799, a real 16-foot-tall stuffed giraffe, and a detailed model of a schooner made from 27,000 matchsticks, were interspersed with a myriad of stuffed squirrels on various vehicles (motorcycle, firetruck, horse, etc. ), a random pile of women's shoes, and a life-size animatron of Hannibal Lecter. It's...eclectic. The kids each picked out their favorites. Will liked the aforementioned schooner-made-of-matches. Josh went back over and over again to the lion, taxidermied into a snarling leap. Evan's favorite was the eight-foot-long model of a World War II destroyer. I loved a huge, intricately carved door brought back from China by a US ambassador. Gene says he most enjoyed just watching the kids discover new treasures around every corner. If you have a free weekend afternoon in Spokane, it's worth the $8 (kids 8 and under are free) just for the entertainment factor. 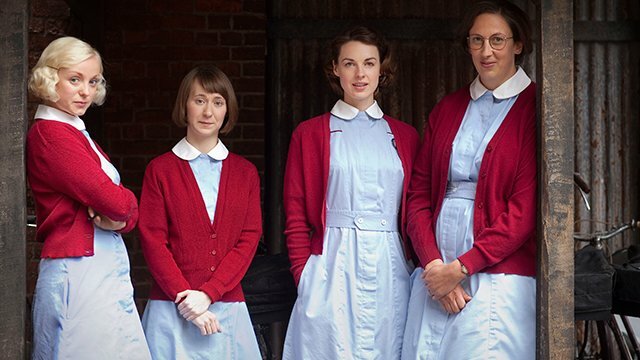 The second season of Call the Midwife just finished airing in the US this past Sunday. Set in the 1950s, the series follows the lives of several midwives based out of Nonnatus House, a nursing convent in the East End of London. I started watching Call the Midwife to fill the void the end of Downton Abbey left in my life, and I think I've come to like it even better than Downton! I get a kick out of the warning preceding each episode: "The following program contains mature content which may not be suitable for all audiences. Viewer discretion is advised." There are birth scenes, you see. You don't actually see anyone's private parts, but they do manage some fairly realistic recreations of what births may have been like prior to widely available epidurals, when most births happened at home. I suppose if you've never given birth or seen a birth or read about a birth, the yelling and bodily fluids might be upsetting, but there are lots of shows I think I'd slap that warning on before Call the Midwife. It's a tear-jerker, though. Lots of sniffles and happy moments, too. Pa decides that's far too glum a tune to be singing on a celebratory night, so he switches to "Paddle Your Own Canoe." The boys loved this one! I just got back from a lecture given by Dr. Bart Ehrman, the author of Misquoting Jesus which I reviewed here. My big project for tomorrow is writing a blog post about his comments, linking them specifically to the LDS understanding of scripture. I'm really excited, but a bit nervous, too, because it'll be my first post for Spokane Faith & Values as a contributing writer. Of course, I'll let you know when it's published on the SpokaneFAVS site. Wish me luck!